Every year as I make my way from the hot Southwest to the cooler climate of Michigan's Upper Peninsula my monthly costs go up due to increased gas usage incurred by the long distance travel (the pickup/Mini combo only gets 10 mpg). One way I stretch my budget during this period is by "casino camping" at the Indian casinos across the UP. Most welcome RV'ers for a couple of nights and a few even provide free electrical hookups. I reviewed one of the more popular casinos here: Kewadin St. Ignace Review . 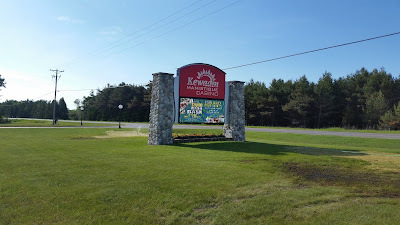 I'm actually at the Kewadin Manistique casino right now which offers free electrical hookups. So if I can break even playing blackjack (yeah, right!) 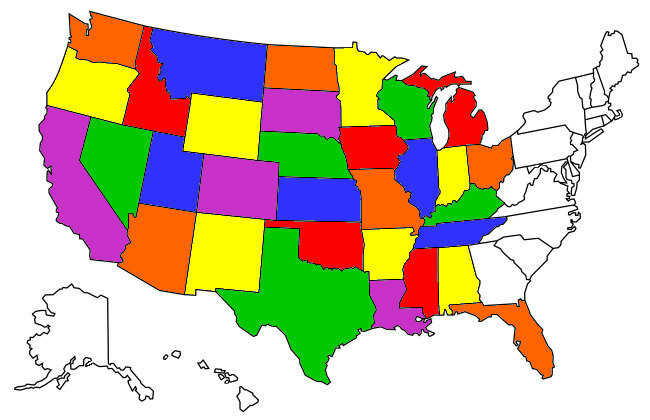 I can end up saving $15 or $20 a night I'd spend even at my Passport America discounted rates. Sometimes I even leave the casino with more money than I came with! The Mini's grassy site at Kewadin Manistique Casino. 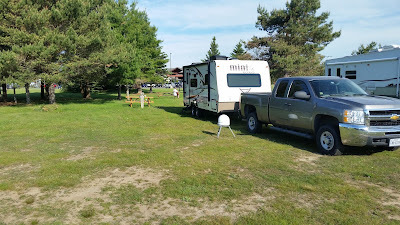 Surprisingly, there aren't that many places in Michigan's UP that you can boondock in, at least that I've found, so utilizing the free casino camping is a good way to keep costs down.